This exquisite pearl and diamond necklace features a diamond frosted floral figure dangling with a single cultured pearl. 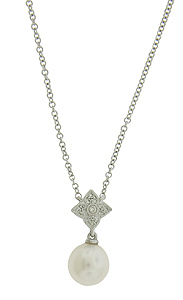 The estate necklace fashioned of 14K white gold. The chain measures 18" in length.